What Is an XSD File? A file with the XSD file extension is most likely an XML Schema file; a text-based file format that defines validation rules for an XML file and explains the XML form. Since XSD files are schema files, they provide a model for something else, XML files in this case. For example, an XSD file can require that the XML file have certain boundaries, relationships, order, attributes, nested characteristics, and other elements, as well as set any restrictions. XML files can reference an XSD file with the schemaLocation attribute. HobbyWare's Pattern Maker cross stitch program also utilizes the XSD extension for its format. XSD File in Visual Studio Code. Because XSD files are text files that are similar in format to XML files, they follow the same sort of open/edit rules. However, most questions regarding XSD files revolve around how to create them; here's a great blog post about creating XSD files. 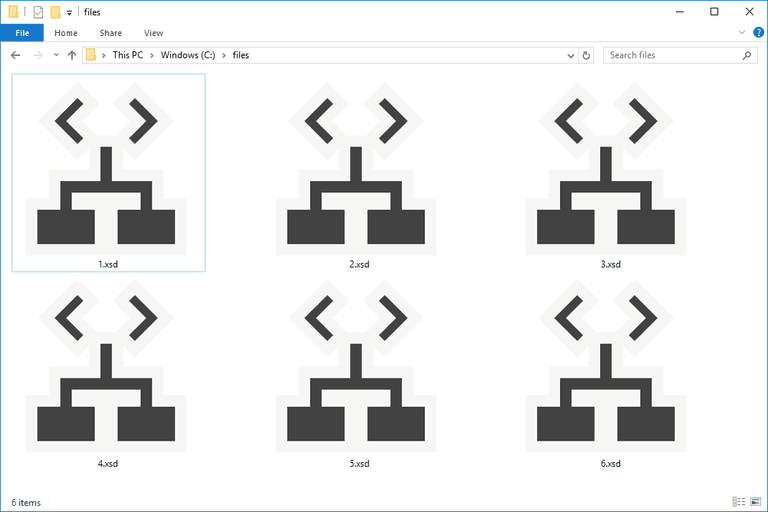 SchemaViewer is a free program that will display XSD files in the proper tree format, which makes them easier to read than with a simple text editor like Notepad. XSD files can also open with Microsoft Visual Studio, XML Notepad, EditiX XML Editor, Progress Stylus Studio, and XMLSpy. Oxygen XML Editor is one of a few XSD openers that works on Linux, Mac, and Windows. You can use a text editor as an XSD viewer and editor, too, given that the file is just a text file. See some of our favorites in this list of the Best Free Text Editors. If you're dealing with an XSD file used with Pattern Maker, you can, of course, open it with that software. However, for a free way to open and print the pattern file, HobbyWare offers the Pattern Maker Viewer program. Just drag the XSD file into the program or use the File > Open... menu. This viewer also supports the similar PAT format. The Crossty app for iOS and Android can open cross stitch XSD files, too, but it's not free. The easiest way to convert an XSD file to another format is to use one of the XSD editors from above. For example, Visual Studio can save an open XSD file to XML, XSLT, XSL, DTD, TXT, and other similar formats. JSON Schema Editor should be able to convert XSD to JSON. See this Stack Overflow thread for some more information on the limitations of this conversion. Another conversion you might want is XSD to PDF so that you can open the XSD file in Adobe Acrobat Reader or some other PDF viewer. There probably isn't much of a reason to convert an XSD file to PDF except to ensure that the code is visible on any computer that opens it. You can save XSD to PDF with this XmlGrid.net converter. If what you're looking for is an XML to JSON converter, there's this online XML to JSON converter that you can use to do that. The XML Schema Definition Tool can convert XDR, XML, and XSD files to a serializable class or dataset, like the C# class. You can use Microsoft Excel if you need to import data from an XSD file and put it into an Excel spreadsheet. In this "How to convert XSD file to XLS" question on Stack Overflow, you can see how to create an XML source from the XSD file, and then drag and drop the data right onto the spreadsheet. It's likely that the Pattern Maker program we mentioned above (not the free viewer) can be used to convert an XSD cross stitch file to a new file format. If your XSD file doesn't open with the programs and tools from above, there's a good chance that you're not really dealing with an XSD file at all, but instead a file that shares a similar file extension. For example, the XDS suffix looks an awful lot like XSD but is instead used for DS Game Maker Project files and LcdStudio Design files. Neither of those file formats are related to XML files or patterns. The same concept applies to many other file formats, like XACT Sound Bank files that use the .XSB file extension. They are sound files that will not open with any XSD opener or file converter. If your file doesn't end with .XSD, research the suffix to find which programs are able to open or convert that specific file type.